If you want a first-rate automatic pool skimmer that will solve your pool debris problem and will give you more leisure time to enjoy your pool, the PoolSkim is your answer to keep your pool sparkling � 24 hours per day/7 days per week, season after season! The award-winning PoolSkim connects to your inlet return fitting and uses the power of the water returning to the pool to create a venturi suction that draws all floating debris from the entire area of your pool -- even where debris collects in dead spots. Leaves, insects, grass clippings, hair, pollen...even dust are drawn to the PoolSkim like a magnet and collected in a sturdy nylon mesh clip-on bag. The patented design of the PoolSkim sets it apart from most automatic pool skimmers in debris removal and durability. The PoolSkim effectively removes debris from all areas of any size pool, while improving circulation. Constructed of high-quality polyurethane and PVC pipe connectors, the PoolSkim will last season after season.The PoolSkim is not compatible with Intex pool fittings. Unlike most pool skimmers, the PoolSkim is not connected to your pump. 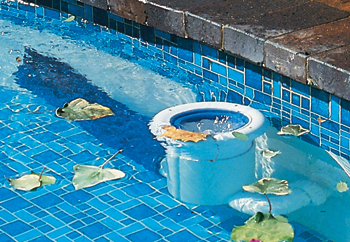 The PoolSkim attaches to the inlet return fitting �where the water flows back into your pool. The jet of water going through the body of the PoolSkim creates a gentle, yet effective venturi that draws debris in through the floating hat. The floating hat is self-adjusting so the PoolSkim always skims effectively � even if heavy rain or evaporation alters the water level. Instead of a messy basket to empty, the PoolSkim is provided with an easy to use, sturdy nylon mesh clip-on bag. To clean, just clip it off, empty and clip it back on. Designed to suit above-ground, in-ground, concrete, vinyl or fiberglass swimming pools � no portables. Attaches to an inlet return located on the side of your pool � not your pump. No extra booster pump is required. The PoolSkim comes with a range of fittings for easy installation in new or existing pools. The PoolSkim actually enhances the cleaners operation by skimming debris on top before it gets waterlogged and sinks to the bottom. Ideal for leafy pools! 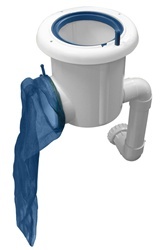 When a typical skimmer basket clogs, water to the pump is severely restricted and places extraordinary strain on the motor � often leading to pump burnout and costly replacement expense. Because the PoolSkim is connected to the inlet return, water flow to the pump is not restricted � even when the clip-on bag is full. No more wasted hours manually cleaning the pool with a pool net! 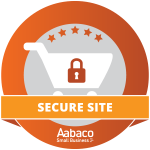 No more frustration with inefficient pump or skimmer baskets!